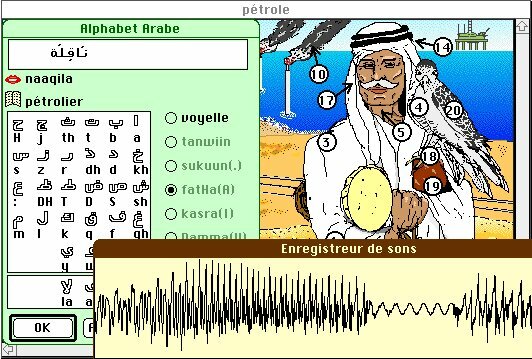 A computer program intended to teach Arabic language to students: they can easily learn its writing system and the pronunciation, renowned to be very difficult. One program supports 2 modes of operation - student mode and teacher mode. About 20 exercises coming from scenes of daily life are already included in floppy disks (total number 4). In teacher mode, the program allows the latter to construct his own exercises by importing pictures made by other drawing programs or scanners. He can also print exercises to carry out paper test to his students. You can record your voice in order to compare with the teacher's, by visualizing the wave forms. The accent used is that of Middle East (Syria, Lebanon, Iraq, Saudi-Arabia etc.). It is very closed to the classic Arabic and understandable by everybody, including those living in North Africa. If you purchase a commercial version, you will receive a password to download freely the updating program. Click on one of the numbers in a picture to learn how to pronounce and write the items in Arabic. In this screen the numbers are in Indian numerals but may be used the traditional Arabic numerals too. The size of picture could be fairly large if you wish because the program can import ones up to 1024x1024 pixels. You can also learn Arabic letters by drawing them with the mouse and it is the computer which will recognize your handwriting. There are 3 levels of difficulty: in easy level, outline and order of tracing are shown, in medium level only outline and in hard level you have no help. In teacher's mode, you can construct your own exercise by adding up to 20 questions per picture. You are importing your own or purchased pictures in the commerce. Add a question by selecting the arrow's direction and then move the item number where you want by just dragging it with the mouse. After constructed an exercise, you can display all the answers in order to control the content. You can also print the exercise and carry out a paper test for your pupils by hiding one of the items: Arabic words, pronunciation or meaning. Windows 2000, XP, Vista or 7, 16 Meg of Ram, 10 Meg of free space in the hard disk and color monitor VGA or beyond. A sound card is necessary, if you want to hear or record the voice. Mac/OS 7.0 or later (X or later are NOT supported), 4 Meg of Ram and 10 Meg of free space in the hard disk. A microphone is necessary, if you want to record the voice. The image is not very nice, if you have no color monitor. Download Windows demo (English version) asetupd.exe (773925 bytes). Download Macintosh demo (English version) flarb11d.sit.bin (578432 bytes). You can purchase Free Light Arabic by downloading the program and exercises through Internet. The offer includes both Windows and Macintosh version, and costs only 30 US$. In order to purchase it with a credit card, please click on the button below*.